A new mechanical framework is used to model the drift of sea ice in a narrow channel between Greenland and Ellesmere Island. It is able to reproduce its main features : curved cracks, ice “bridges” that stop the flow of ice for several months of the year and some thick, strongly localized ridged ice. The simulations suggest that a mechanical weakening of the sea ice cover can shorten the lifespan of ice bridges and result in an increased export of ice through the narrow channels of the Arctic. We analyse CryoSat-2 and Envisat freeboard height discrepancy over Arctic sea ice and we study the potential role of ice roughness. Based on our results, we build a CryoSat-2-like version of Envisat freeboard height. The improved Envisat freeboard is converted to sea ice draught and compared to in situ mooring observations to demonstrate the potential of our methodology to produce accurate ice thickness estimates over the 2002–2012 period. Reaction rates of radiatively and chemically active trace species are influenced by the mobility of air contained within the snowpack. By measuring wind speed and the evolution of a tracer gas with in situ sensors over a 1 m horizontal grid, we found that inhomogeneities in a single snow layer enhanced air movement unevenly as wind speed increased. This result suggests small-scale variability in reaction rates that increases with wind speed and variability in snow permeability. Soil organics carbon (SOC) and its influence on terrestrial ecosystem feedbacks to global warming in permafrost regions are particularly important for the prediction of future climate variation. 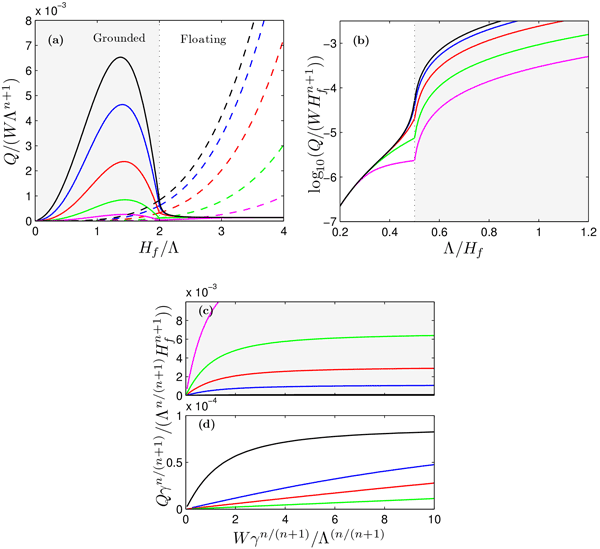 Our study proposes a new surface–subsurface, joint deterministic–stochastic hydrological–thermal–geophysical inversion approach and documents the benefit of including multiple types of data to estimate the vertical profile of SOC content and its influence on hydrological–thermal dynamics. As the Arctic sea ice extent drops, more ship traffic seeks to take advantage of this, and a need for better wave and sea ice forecasts arises. One aspect of this is the location of the sea ice edge. The waves here can be quite large, but they die away as they travel into the ice. This causes momentum to be transferred from the waves to the ice, causing ice drift. However, our study found that the effect of the wind drag had more impact on the ice edge position than the waves. Glaciers on Novaya Zemlya (NVZ) retreated rapidly between 2000 and 2013. This was far faster than the previous 25 years, but retreat then slowed from 2013 onward. This may result from changes in broadscale climatic patterns. Glaciers ending in lakes retreated at a similar rate to those ending in the ocean, and retreat rates were very consistent between glaciers, which contrasts with previous studies. As the Dome C region is a key area for oldest-ice research, we need to better constrain the geothermal flux (GF) so that past basal melt rates are well constrained. Our inverse heat model significantly reduces the confidence intervals of the GF regional field around Dome C, which ranges from 48 to 60 mW m−2. Radar echoes need to be interpreted knowing the time lag of the climate signal to reach the bed. Several old-ice targets are confirmed and a new one is suggested, in which the GF is very low. This paper provides the first complete view of the drainage system of a large Himalayan glacier, based on ice-cave exploration and satellite image analysis. Drainage tunnels inside glaciers have a major impact on melting rates, by providing lines of weakness inside the ice and potential pathways for melt-water, and play a key role in the response of debris-covered glaciers to sustained periods of negative mass balance. The paper describes one of the first attempts to use the so-called adjoint data assimilation method to bring Arctic Ocean model simulations closer to observation, especially in terms of the sea ice. It is shown that after assimilation the model bias in simulating the Arctic sea ice is considerably reduced. There is also additional improvement in the sea ice thickens representation that is not assimilated directly. High Mountain Asia’s rivers, which serve more than a billion people, receive a significant portion of their water budget in the form of snow. We develop an algorithm to track timing of the snowmelt season using passive microwave data from 1987 to 2016. We find that most of High Mountain Asia has experienced shorter melt seasons, earlier snow clearance, and earlier snowmelt onset, but that these changes are highly spatially and temporally heterogeneous. To derive paleotemperatures from ice cores we must know all processes involved in ice formation. At the Antarctic base Dome C, a unique precipitation data set plus stable water isotope data enabled us to study atmospheric processes influencing isotope ratios of precipitation in detail. Meteorological data from both automatic weather station and an atmospheric model were used to investigate how different atmospheric flow patterns determine the precipitation parameters used in paleoclimatology. By means of airborne sea ice thickness surveys, remote sensing data and results from a numerical model, we show that winter ice dynamic in the Laptev Sea has a preconditioning effect on local summer ice extent in addition to atmospheric processes acting on the ice cover between May and September. We conclude that the observed tendency towards an increased ice export further accelerates pack ice retreat in summer and fast ice decay.